A scarifier is used to remove most coatings from bitumen surfaces prior to new road line marking taking place. The tungsten tips of the scarifier are designed to aggressively erode the surface, leaving a rough finish that is gradually smoothed by vehicular traffic over time. This process can be dust free through the connection of a dust extractor system. Road line marking on bitumen surfaces is difficult and the markings might not be easily seen by traffic and pedestrians. 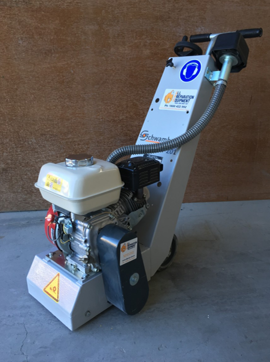 To ensure that all safety line markings are clearly seen by everyone on the road, a scarifier is used to remove old coatings from bitumen roads and car parks. This process makes the new road line markings appear much brighter and easier to see in all weather conditions. Call us on 0423 832 531 to discuss whether your surfaces requires scarifying, before new road linemarking takes place.